The High Court warned the associations of restaurants owners that they will not be allowed escape civil and criminal liability in case any unfortunate incident takes place, as there was virtually no space for emergency vehicles to enter the area. New Delhi: The Hauz Khas Village in south Delhi is "a ticking time bomb", the Delhi High Court has said. It also observed that neither the government agencies, nor the restaurant owners of the area have responded to its queries on safety and other issues. A bench headed by acting Chief Justice Gita Mittal warned the associations of restaurants owners that they will not be allowed escape civil and criminal liability in case any unfortunate incident takes place, as there was virtually no space for emergency vehicles to enter the area. The bench, which also comprised Justice C Hari Shankar, was worried about how the South Delhi Municipal Corporation, Delhi Police, Delhi Fire Services and other agencies had allowed commercialisation of the village which had led to public nuisance and health hazards. "The reports of Delhi Police, Delhi Fire Service, SDMC and the Delhi Jal Board illustrate that the Hauz Khas Village is a ticking time bomb without essential civic and emergency services. 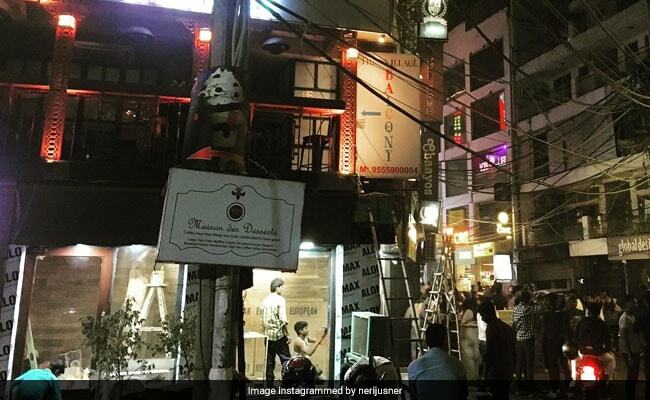 "Our repeated queries regarding quantum of solid waste (garbage) and sewage generated by these restaurants (pubs,bars and cafes in Hauz Khas Village) evoked no response from either the authorities or the restaurant owners," it observed. The court's observation came during hearing of PILs filed by social activist Pankaj Sharma and advocate Anuja Kapur, who alleged that over 120 restaurants and pubs were running in the Hauz Khas Village without any approved building plans or no objection certificate (NOC) from the authorities including the fire department. They also alleged that the streets in the village were not wide enough for a fire tender to move easily in case of an emergency and only five restaurants had fire clearance. This prompted the bench to say that the licences for the pubs and restaurants at the village, which is in the heart of a densely populated residential area, were granted by the civic bodies without checking the ground realities. The sewage system, the bench noted, was also not robust enough to take the load from the kitchen and bathrooms of various restaurants and pubs. "The adverse impact on the hygiene and environment so far as the citizenry is concerned thereby, would be insurmountable and irreversible," it said, adding that "more worrying" fact was that in case of an emergency, it would be impossible to reach the buildings inside the Hauz Khas Village. "This position is also highlighted from the affidavit of the Deputy Commissioner of Police pointing out that during a mock-drill for a terrorist attack, the NSG commandos could not reach the destination within the village," the order said. The bench observed that the plea entail the examination of the rights of the restaurant owners as against the rights of the members of the public. The bench further said that the restaurant owners "have been put to full notice of the dangers involved in the activities which are being run and also of the fact that in case of any unfortunate eventuality, emergency vehicles would not be able to reach the place of the incident". "In the circumstances and the reports placed before us, whatever be the final decision, we have no manner of doubt that in case there is a mishap or any loss of life or limb in the present case, the restaurant owners will not be permitted or allowed to escape the liability, civil and criminal for the same," the bench said. It was critical of how the repeated queries regarding quantum of solid waste and sewage generated by these restaurants, evoked no response from either the authorities or the restaurant owners. "It appears from the material place that no comprehensive solid waste management and sewage disposal evaluation has even entered the minds of the concerned experts or the municipal authorities while permitting such activities or granting licence," it said. The bench asked Delhi Jal Board to inspect each premises in Hauz Khas Village with regard to water supply (including whether it is commercial / residential) as well as borewells, which may have been dug in these properties within three days. "To our mind, the situation and the issues are of serious nature and need immediate action," the bench said and listed the matter for September 26.